efore white nationalists protested in Charlottesville over the weekend, before a man allegedly plowed a car into a group of people killing one and injuring at least 19, violent clashes in Berkeley offered a window into the motives and tactics of Identity Evropa, one of the white supremacist groups intimately involved in both protests. For leaders of this white nationalist movement, the April 15 “Battle of Berkeley" was a self-described test run to see just how far they could push the bounds of protesting, according to numerous public statements from members of the white supremacist movement. 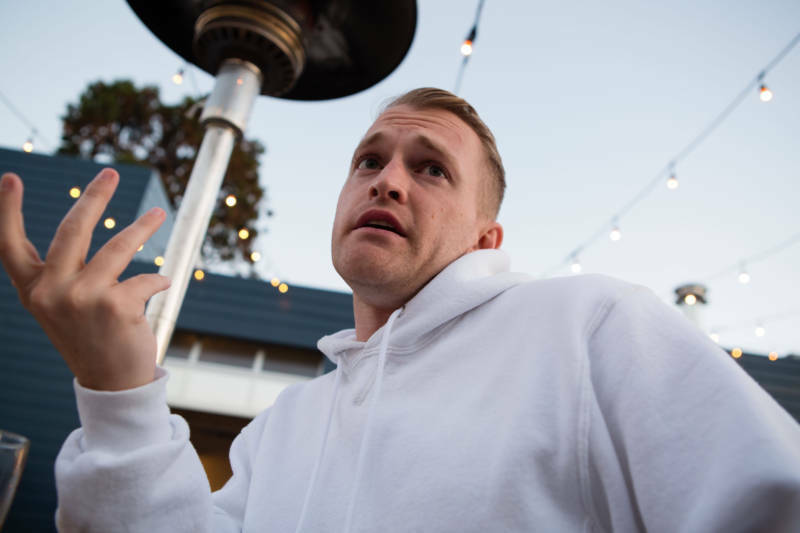 Nathan Damigo is a founder of the California-based Identity Evropa, profiled by El Tecolote newspaper in December. 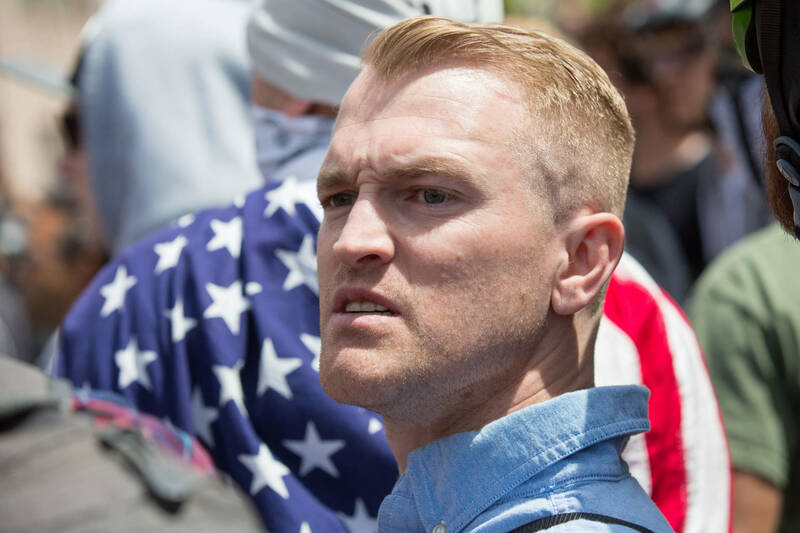 A former Marine infantryman and convicted felon who lives in Stanislaus County, Damigo is being credited with helping to lead the Charlottesville protest, along with other white supremacist rallies around the country. Damigo has made these rallies a key driver for recruiting new members of the group. He did not respond to requests for comment on Saturday about his involvement in the Charlottesville event following his arrest there. 'I’d love to take credit for it, but it was more Nathan.' Richard Spencer of the white supremacy group the National Policy Institute on Nathan Damigo's organization around a white nationalist rally in Charlottesville, Virginia, on Aug. 12. But over the course of multiple hourlong interviews over several months this year, Damigo, 31, said his group is engaged in peaceful protests protected by the First Amendment. Before Charlottesville, Damigo was probably best known for punching a 19-year-old woman in the face in Berkeley. That moment was captured on video. In the video, Damigo -- sporting a hipster haircut, collared shirt and clenched fists -- runs up to a young, dreadlocked woman holding a camera and punches her. Damigo told KQED he punched the woman because she was a threat; because she was going to attack his friends; because she was a member of Antifa, a leftist confederation of socialists and anarchists -- some of whom have committed acts of violence and arson. Essentially, Damigo said he punched her because he had to. That’s not what KQED witnessed at the scene of the attack, however. Damigo violently moved through the crowd. Smoke bombs and flash grenades and glass bottles were thrown. Thick tear gas filled the air. Leftist protesters, many of them aging men, were beat up. Police were hit with firecrackers. 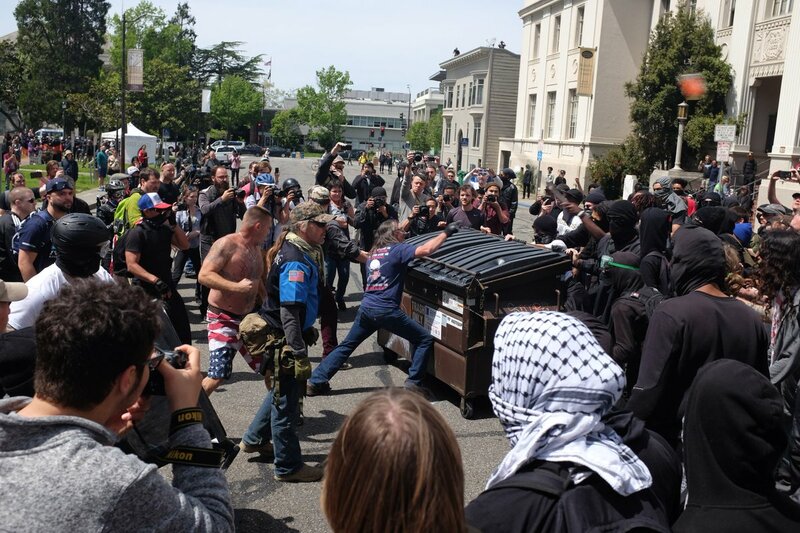 At one point, Antifa (wearing black hoodies and masks) and the far right (wearing red hats, flag capes and paramilitary armor) fought over who could control a dumpster that was pushed down the street. Damigo found himself outside of the roaring street brawl he helped create. Alone for a moment, he stopped in the middle of the street. Then, he ran across the street, right up to the woman, and hit her. After she fell, Damigo turned, smiled and jumped back into the rolling scuffles. Damigo’s involvement in the "Battle of Berkeley" is an important moment for the white supremacist movement because it attracted supporters from around the country. "A large amount of the violence that has occurred may be due to the inroads we are making," Damigo told an interviewer after the Berkeley events. This frenetic, violent, yet charismatic man with extreme racist views helped organize the Charlottesville rally. And he’s helping to mobilize an entire generation of white supremacists. 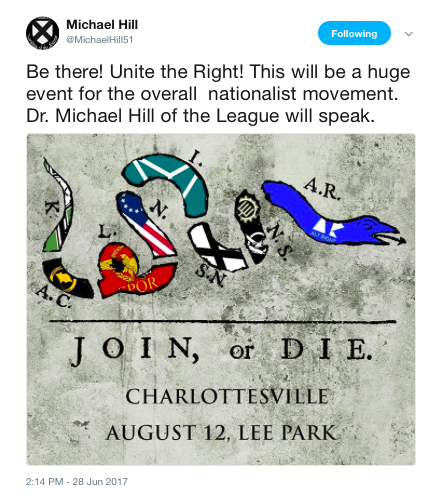 A graphic promoting the Charlottesville rally included the insignia of Damigo's group Identity Evropa in section "I." of the snake. Nathan Damigo was born in Lewiston, Maine. In a long conversation with KQED, he noted with irony that the community had accepted early groups of resettled refugees. Eventually, his mother moved the family to San Jose. In the South Bay, Damigo traced the beginning of his “race realist” awakening to feeling out of place in a multiracial city. He said he would feel uncomfortable in situations where he was the only white person. Damigo went to Liberty Baptist School in San Jose through his senior year. His mother worked as a teacher there. Like so many other California kids of his age, he listened to bands like Metallica and Soundgarden, watched "Teenage Mutant Ninja Turtles," and dreamed of being a pro skater. Yet, as he aged, those dreams morphed into aspirations of a military career -- his father had served in the Marine Corps. Damigo said his desire to serve became more pronounced after the Sept. 11 attacks. Damigo also credited his socially conservative family, who he said raised him to have pride in the country, for influencing his decision to enlist. He would serve two deployments in Iraq in the infantry. It was on these tours that Damigo’s views on race began to be shaped by the violent conflict he saw on a daily basis -- killings, murders, explosions and misery. During a psychological evaluation conducted for the court as part of the criminal case, Damigo said he attacked the cab driver, Changiz Ezzatyar, because he mistook him for an Iraqi. Damigo said the decision came after a night of solitary heavy drinking. Kraft added that some PTSD patients engage in thrill-seeking behavior. “Based on this Marine’s history, which is free of any behavior even remotely similar to the night of his arrest, it is likely that he may have become one of those patients,” Kraft concluded. His family strongly defended Damigo during the court hearing, and his story was featured on the HBO documentary, "Wartorn," as part of a broader series on post-traumatic stress disorder in veterans. "It was like being dropped in a nightmare," his mother, Charilyn Damigo, told HBO. Damigo's mother and others wrote letters to the court, urging leniency and understanding from the judge. But worried that a defense centered on PTSD would fail, Damigo accepted a plea deal and was sentenced to six years in prison. It was during that time that he started reading the words of former Ku Klux Klan leader David Duke, who remains a white supremacist leader and was at the Charlottesville event. Damigo's white supremacist group -- Identity Evropa -- is based in California but has chapters on college campuses throughout the country. The group has a high visibility on campuses from San Diego to Tuscaloosa to Charlottesville. On these campuses are fliers, banners, posters and bathroom graffiti advertising Identity Evropa videos. Damigo’s views on race and nationalism may have been shaped by the four years in prison, but in many ways they are clear echoes of older white supremacists such as Duke. In an interview with KQED, Damigo said he believes white people need their own separate country. But he added that he also wants his organization to be seen as more acceptable to a broader population. For example, Damigo has banned members of Identity Evropa from having tattoos on their faces, necks or hands. “We don’t want to be seen as overly threatening,” he said. Damigo also doesn’t swear, instead using words like “gosh” or “golly” in the place of expletives. And as other racists have argued for forceful relocation or purging of minority groups from American society, Damigo avoided talking about how he would create a white-only homeland. But he doesn’t avoid conflict. Instead -- as they did in Berkeley and Charlottesville -- Identity Evropa and aligned white supremacist groups seem to revel in goading counterprotesters into violent clashes. Damigo also indicated that at this stage he’s more interested in recruiting members and building a durable movement than hammering out specific policy. “I mean, this is the stuff that will likely never happen in my lifetime,” he said. To that end, Damigo said he is targeting college-educated white males as potential new members of Identity Evropa. That’s a big reason these rallies have been largely organized on college campuses. They’re not just protests. They’re recruitment drives. It’s a strategy shared by Damigo’s friend, Richard Spencer, one of the most outspoken and visible members of the white supremacist movement. Spencer heads the National Policy Institute, a white supremacy group. This approach appears to be working for Identity Evropa, which has recruited more than 500 members at colleges across the country, according to Damigo. KQED could not independently verify that claim. But Brian Levin -- a noted hate-group researcher and professor at CSU San Bernardino's Department of Criminal Justice -- said he does not believe those numbers are accurate. However, several prominent social scientists who have begun studying the rise of the hard right said they, too, are seeing a significant uptick of participation in racist groups. One of those researchers is Jean Twenge, a psychology professor at San Diego State University who wrote the book "iGen." She said her research shows that a minority of people younger than 24 hold racist beliefs, but there has been an increase in those numbers. “I looked at whether white people thought black people are lazy and unintelligent, and there was an uptick in the youngest respondents,” Twenge said. “They’re showing a lot of prejudice, really,” she added. Twenge is unsure why this trend is happening. But she said anecdotally, there appears to be evidence that white nationalism is taking root among young men. Berkeley sociologist Arlie Hochschild agreed. During research for her book, "Strangers in Their Own Land: Anger and Mourning on the American Right," she ran across a hardening of views among young men, specifically about blacks and Muslims. That anger -- that somehow white history and status in society is being displaced by minority groups and women -- was a driving force and rallying cry among white supremacists in Charlottesville, who marched with tiki torches lit to protest the removal of a Robert E. Lee statue. The event to celebrate confederate and white heritage was organized locally by Jason Kessler, a local white nationalist. According to Richard Spencer, who spoke to KQED a few weeks before the violence and deaths in Charlottesville, Damigo and his group took the lead to organize white supremacist participation among people from outside Charlottesville. “I’d love to take credit for it, but it was more Nathan,” Spencer said. But the outcome in Charlottesville is markedly different than it was in the Berkeley rally. Three people have died, including 32-year-old Heather Heyer, allegedly run over by an apparent white supremacist. Two Virginia State Police officers -- Pilot Lt. H. Jay Cullen and Trooper-Pilot Berke M.M. Bates -- died a few hours later when their patrol helicopter crashed en route to the scene of the violence. Damigo was arrested in Virginia for failing to disperse. He’s set up an online fundraiser for his legal costs related to what he describes as civil rights violations in Charlottesville. Prior to his arrest, Damigo said he was looking forward to more campus events. He told KQED one of his plans is to set up an event at UC Berkeley with Richard Spencer. Editor's note: El Tecolote's Alexis Terrazas contributed to this story, which is presented in partnership with the San Francisco newspaper.